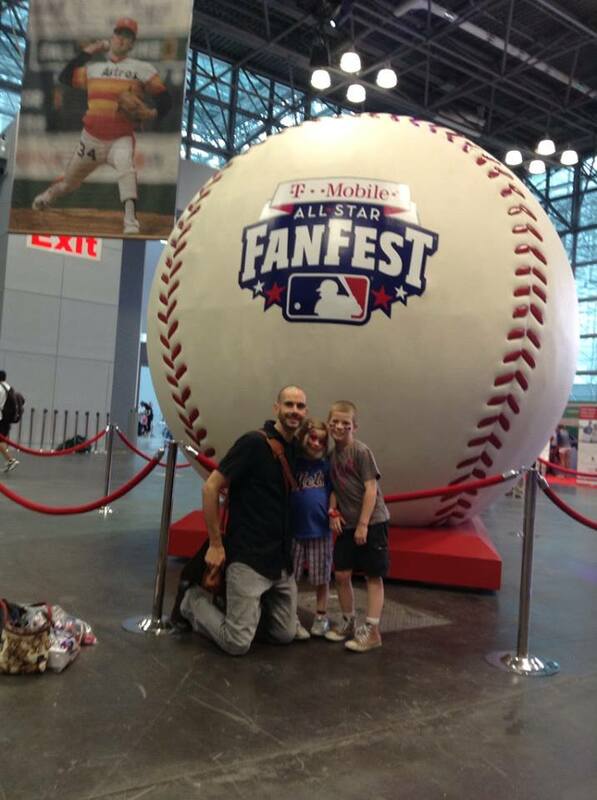 I attended the MLB All Star Fan Fest 2013 in New York City with my two oldest kids (9 and 7). Before we left the house, I tried to describe what a “Fanfest” is to my kids, but they both went in completely different directions as to what we were going to see. My son came the closest. He believed we were going to see a bunch of Major League baseball players walking around signing autographs and taking pictures. He also believed that every team’s mascot would be there and that we should make a game of trying to get a picture taken with every single one. My daughter, however thought we were going to a huge room with a bunch of those giant bouncy thingies and occasionally come across a baseball player. The Fanfest was somewhere in between. 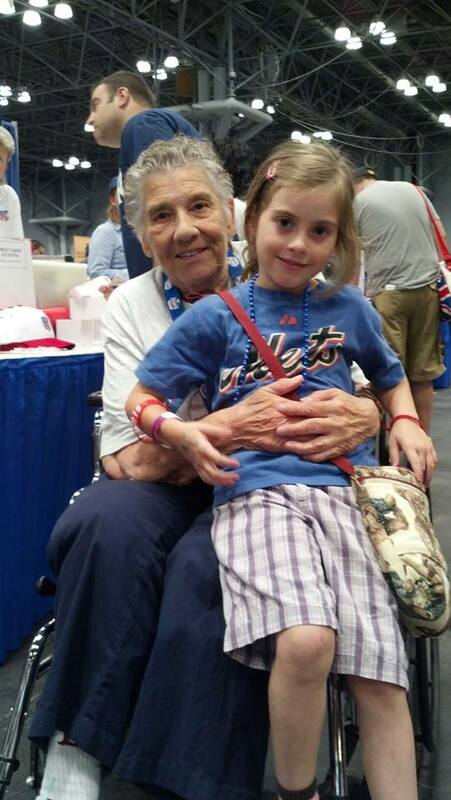 The Fanfest is a baseball fan’s dream. 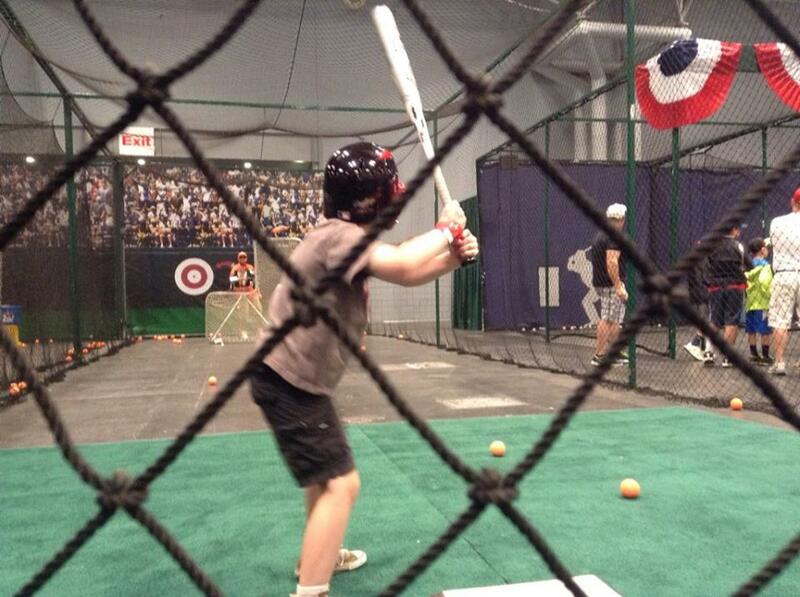 There are batting, pitching and fielding cages, and places to work on your base thievery. There’s a Hall of Fame area to check out some baseball memorabilia from some of the greatest players to ever play the game. Radio shows and sports shows take place on several platforms and baseball heroes from the past can be found signing autographs on various stages. With a marker in one hand and a baseball in the other, my son set out to find some of those players. Every line was huge and the patience level of my kids wore out. By the end of the day, my son had zero autographs. The other mission for the day was the chance to meet Mr. Met. I’m not sure why it was such a huge mission because we’ve met Mr. Met many times at baseball games. Unfortunately, we came up empty. 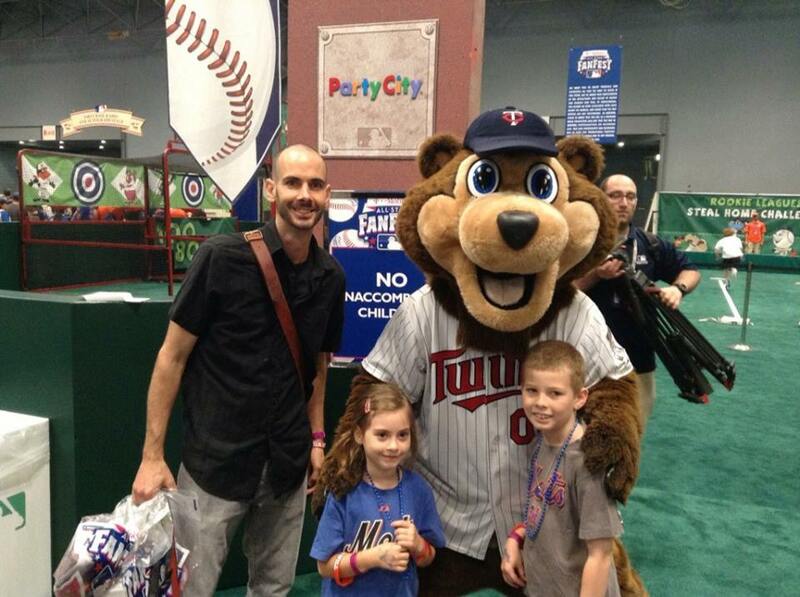 In fact, the only mascot we got to meet was the Minnesota Twin mascot TC. Both kids were happy though to get his picture. 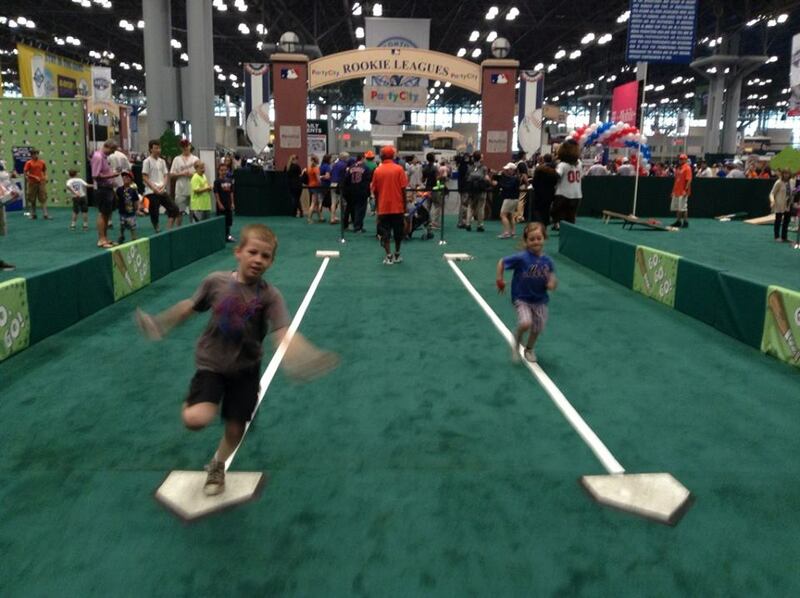 The kids got their fill of hitting, catching, throwing, and running bases and had a great time doing it. As I ran around the huge Javitz Center with them, I even forgot for a moment that we were two kids and one adult and instead played like equals. There’s something about baseball that makes you feel like a kid again and there isn’t a worry in the world. I’m glad my kids didn’t call me by the first name we were having so much fun. Out of all the things we got to do though, the highlight for me was the opportunity to meet the women who inspired the movie A League of Their Own. 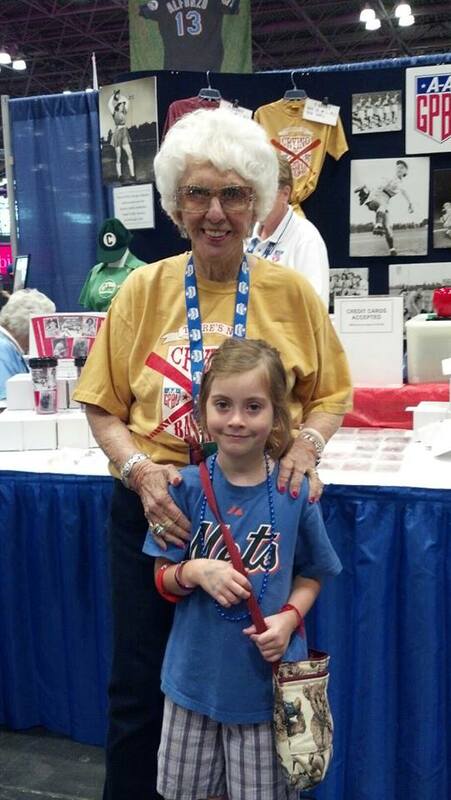 Several women from the AAGPBL (All-American Girls Pro Baseball League) were in attendance and loved talking to everyone that stopped by to see them. As I approached them, I informed my 7 year old daughter how important these women were to her own future. They were so kind to my daughter and talked to her for a while. They even hugged her and encouraged her to fight for her dreams and not to let any boy stand in her way. At the end of the day my kids and I were tired and our feet and legs were sore from all the walking and running. We were happy to have had the experience. My son though was disappointed with one thing. As I got home and unpacked his bag, I pulled out all of his David Wright baseball cards and some baseballs and his glove. He had a happy face throughout the time, but he looked down when I pulled out the items. I asked him about it and he admitted that he thought he would bump into his favorite baseball player. So if you are planning on attending and thinking you will see today’s players, then you will be disappointed. But if you are looking to relive some baseball memories or make some new ones, then you should head over. If you do go, it won’t be an easy day at the ballpark for your bank account. Adult tickets are $35 and tickets for kids 12 and under are $30. Kids under 2 are free. Jason, loved the Blog! You may want to try finding a fan Mailing address and writing to Wyatt’s favorite players, they are often set up to send you back some fan material. I did that with Charles M. Schultz as a kid and was thrilled to get a reply. Thanks Karen. I should have W write to his favorite players. I did when I was a kid. As a volunteer, thank you for writing about your experience. I was glad to share my love of baseball with those I met, and to see kids and parents having a great time together. Previous Entry Is Pacific Rim Appropriate for Kids?